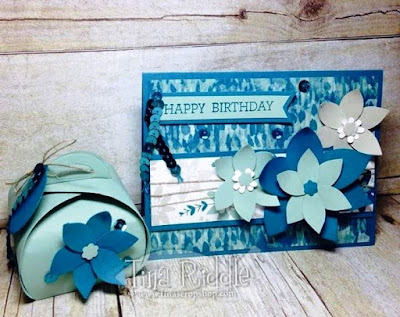 Tina's Crop Shop: OSAT Blog Hop - Birthdays Bash! Hello and welcome to One Stamp At A Time's September Birthdays Bash Blog Hop! 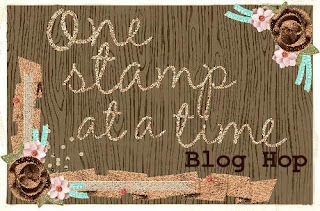 If you have already been hopping then you should have landed here from the Super Talented Pam Staples blog and I'd like to thank you for continuing on with the hop! If you are starting here with me, please make sure that you visit all of the blogs on the hop for some super fun and unique inspiration! 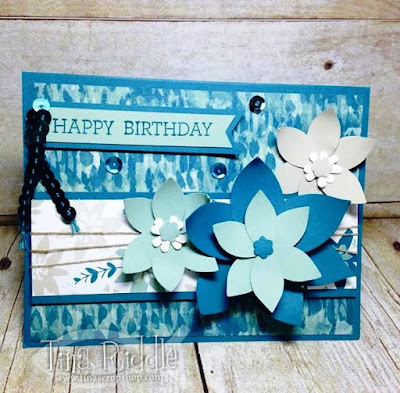 For my card and project I decided to use the awesome Blooms & Bliss Designer Series Paper from Stampin' Up! I love the colors and I especially love the combination of Island Indigo and Mint Macaron! The flowers on one of the DSP designs looks much like a blue poinsettia to me so I decided to use my Festive Flower Builder Punch to recreate it. Usually I sponge the edges of punched flowers but since I was recreating the flowers on the DSP, I left them as is. Sometimes simple is fine.. I have to tell myself this at times. The large flower is Island Indigo and Mint Macaron, and the two smaller flowers and Mint Macaron and Sahara Sand with a bit of white. I used the small flower in the Tree Builder punch for my flower center. The Happy Birthday sentiment on the banner is from the Crazy About You Stamp Set. I also created a Curvy Keepsake Box to match and kept this one really simple by making it in Mint Macaron with an Island Indigo and Mint Macaron flower and an Island Indigo tag. I added a little matching sequin trim to both the card and the Curvy Keepsake Box. Last but not least, I added a few Doodlebug Sequins that matched the Island Indigo on both the card and the Curvy Keepsake box. Please make sure to stop by the Amazing Justin Krieger's blog by clicking the next button! Here is a list of all of our Talented Bloggers in case you lose your way! Tina Rackley Riddle -That's Me!